This is not a particularly attractive photo, but it will interest fans of Pu Erh. It is quite a rare image, in that until recently it wasn’t easy to get inside Pu Erh factories, and it was even more difficult to take pictures of them. 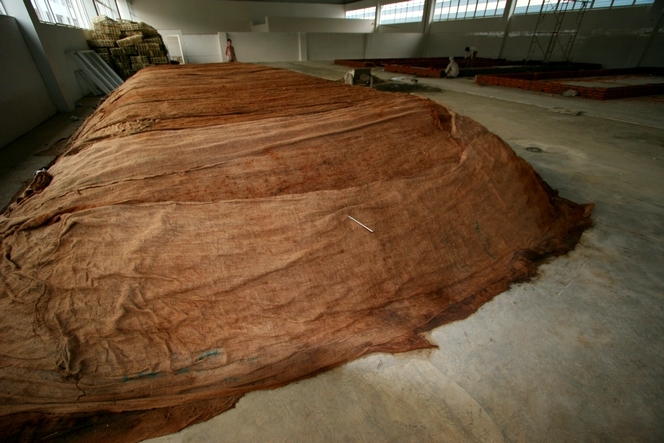 The manufacturing of Pu Erh was supposed to be a secret, or at least it was one of those things that are not revealed to outsiders. Why is this? I don’t know, although I suspect it is due to the fact that there is little visual interest in a tea gradually going mouldy. Pu Erh is the name for fermented tea. As a reminder, black teas are oxidised, and dark teas (Pu Erhs) are fermented. While we are on the subject, the difference between oxidisation and fermentation is that the former is a process that requires exposure to air, whereas the latter takes place in an environment deprived of oxygen. Now you understand better why these leaves have been deliberately damped down and covered: to allow the tea to ferment for around 45 days. A thermometer, which you can see in the foreground, is stuck through the canvas to check the temperature, which can rapidly reach 50 to 60 degrees centigrade.